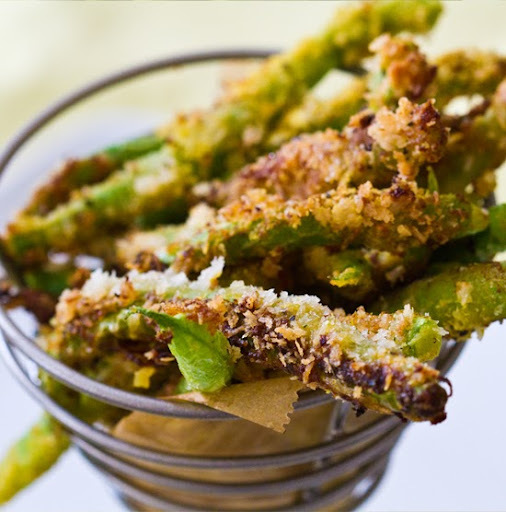 Panko Crispy Green Bean Fries. Just Give Veggies Luv! 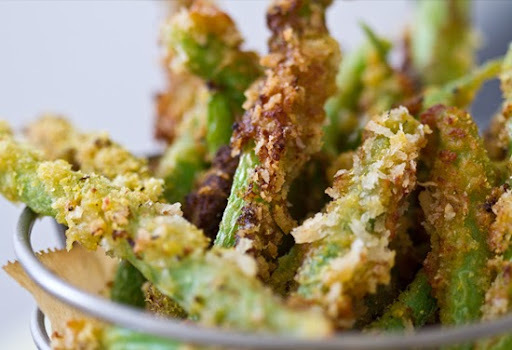 Give veggies love, and they will love you back. Earlier today I read a timely article in the New York Times called "Told to Eat Its Vegetables, America Orders Fries." I squinted, furrowed my brow and a "hmmph" pouted out of my lips. Why was I not surprised by this article? 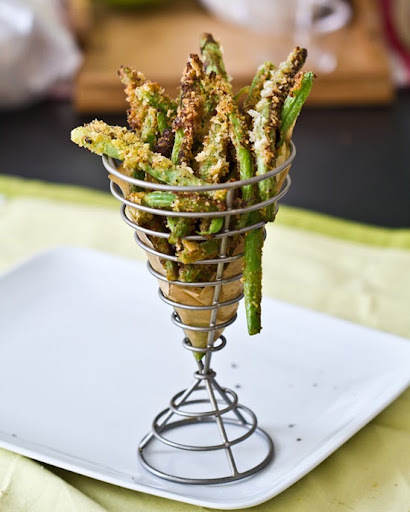 Taking the Fun Out of Veggies. It's true, nutritional guidelines, data tables, calorie charts, finger wagging nutritionists (oh, but you know I love ya) and squinty-eyed doctors can take the fun out of food. Especially veggies. I don't want to do something because I am "supposed to". I will do something because it makes me feel better, look better, glow with energy and when it comes to food... because it tastes delicious. Give Veggies Love... You certainly aren't going to plate some raw broccoli and call it delicious. 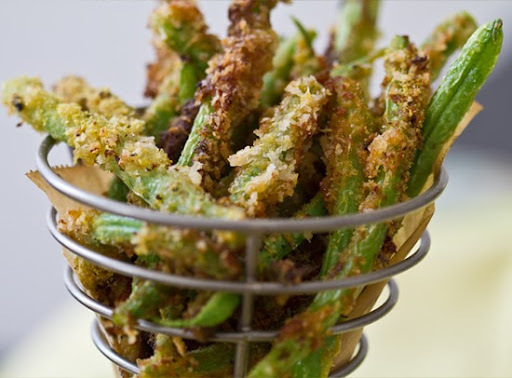 But you can do this: toss the broccoli in some nutritional yeast and EVOO, roast for twenty minutes, toss with salt/pepper and serve = delicious! That raw broccoli just needed a bit of love to make it sing. 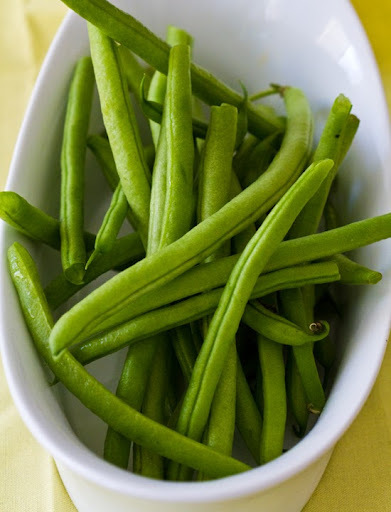 Green Beans. Love 'em or hate 'em..? 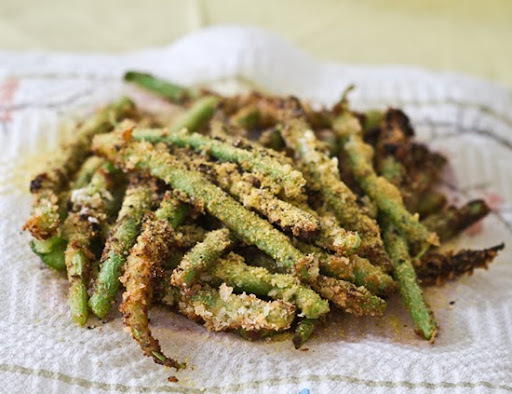 So I gave my veggies (green beans) a little love today and in my opinion they are fantastically fun, delicious and veggie-tastic. And still green beans. Eating veggies can be fun. 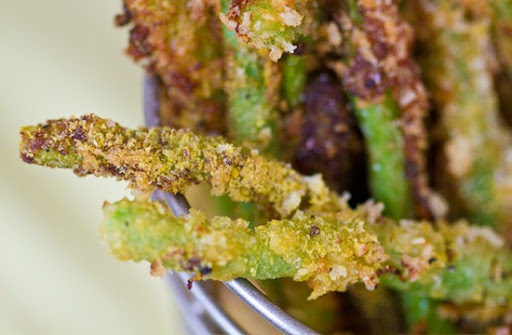 My Panko Crispy Green Bean Fries recipe is kid and adult-bean-hater approved. Husband said "they look good!" Change Your Mind. Because once you (or your kids) see that eating veggies can be fun, fantastic and delicious, you (or they) will lose your grip on that "I don't wanna eat my veggies" balloon - and it will float far far away never to be seen again. Change your thinking and you can change your diet, change your body and change your life. 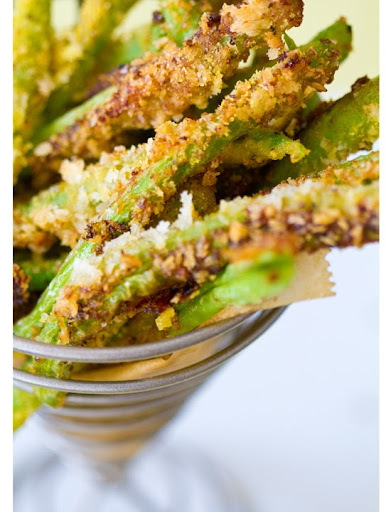 vegan, makes 2 cups of "fries"
*Panko crumbs are light and crispier than traditional bread crumbs. 1. 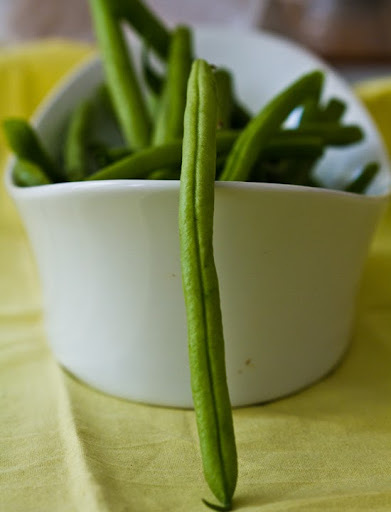 Prep your green beans by washing them, plucking the stems and drying them well. If you want "short fries" slice them in half. 2. 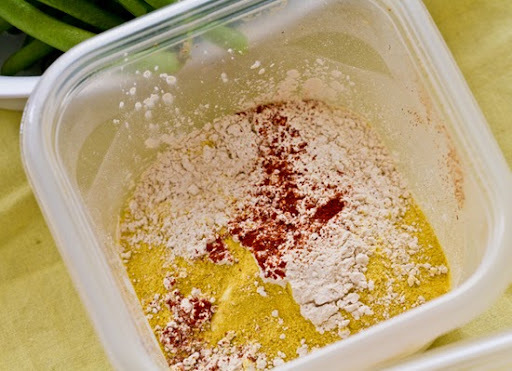 Prep your mixture bowls. Combine all the sticky liquid in one bowl, the flour/flavor ingredients in another and the panko crumbs in another. 3. Add your oil to your preferred pan, I used a medium soup pot, and turn heat to medium. Oil should be hot in about 90 seconds. 4. While oil heats, you can quickly dip and drop your first round of beans.Process: Sticky liquid, flour, panko. You may need to do a double dip if the ingredients are not sticking properly the first time. 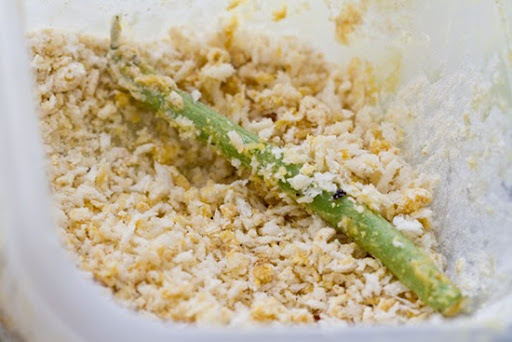 The key is to prep the beans and get them in the pan ASAP so the breadcrumbs mold and cook quickly around them. I'll admit that the process was a bit sketchy for me at first, but once you find a process you like the ingredients will adhere and your beans will come out crisp and golden. 5. Drop your dipped beans and cook for about 30-45 seconds. When they crumbs turn golden, they are done. 6. 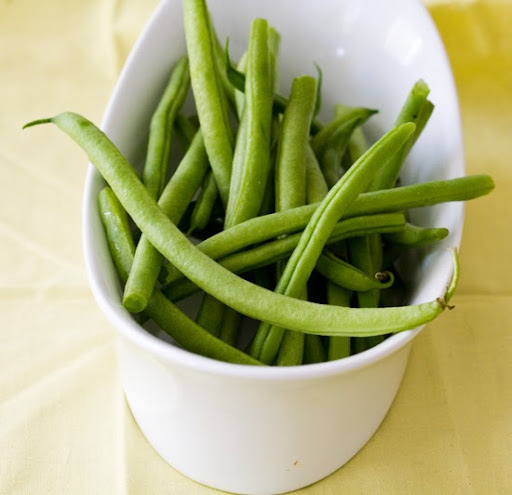 Pull the beans with a strainer or slotted spatula and rest them on a paper towel. 7. Continue with your 2 cups of beans. 8. 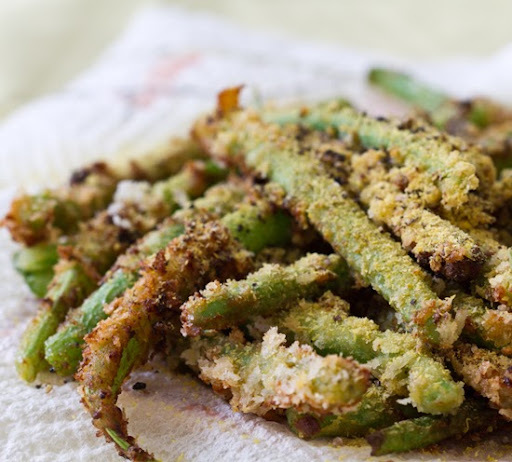 Toss bean fries with sea salt and maybe a bit more of the nutritional yeast. 9. Serve warm with spicy mustard. Enjoy!